By the end of this tutor you will be playing well known tunes such as Mrs MacLeod of Raasay, The Stool of Repentance, Braes of Tulliemet, Pipers Cave and more. The DVD is easy to navigate and has lots of additional information on bowing style, ornaments etc with lists of useful books, CDs, and Fiddle Festivals in Scotland so you can continue learning great Scottish tunes. 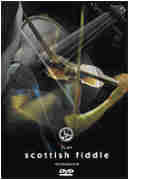 A 12 page booklet is enclosed with all the tunes and helpful hints relating to fiddle playing. Running time aproximately 55 minutes.